A long, long time ago, the god Vishnu came to Earth and became Lord Krishna. 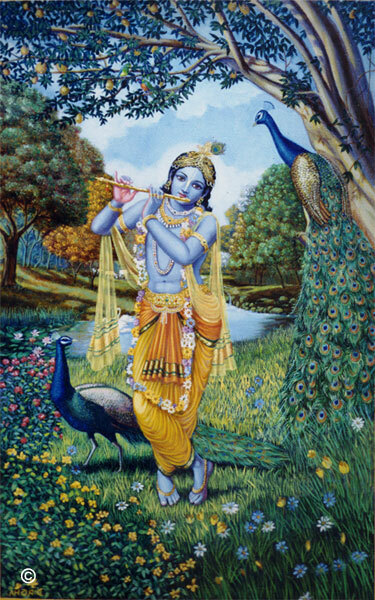 As a young man, Krishna loved to play the flute. He often went for walks in the forests and played for the animals there. They loved his beautiful music. One day, after he had played for them, he fell asleep. He didn't know it but a young boy in ragged clothes had also been listening to his music. When he saw that Krishna was asleep, he crept up to Krishna's side and took the flute. He put it to his lips and tried to play it, but try as he might, he could not play a single tune. All he could produce were odd, sharp notes, which soon woke Krishna up.